This is just a (very) short preview post for The Citadel’s 2015-16 basketball season. I’ll post more about the Bulldogs of the hardwood as the season progresses. There has been a lot of interest (if not downright curiosity) in the upcoming campaign, as new coach Duggar Baucom prepares to unleash his specific brand of hoops mayhem. Duggar Baucom is The Citadel’s new hoops coach. Is he the right choice? Sure, it was just an exhibition game against a largely overmatched Division II opponent, but still. The Citadel attempted 67 three-pointers. 67. The Bulldogs only made 21 of them, though (31.3%). On the bright side, The Citadel collected 22 offensive rebounds (off 57 opportunities from missed FGs/FTs). According to Duggar Baucom on his coach’s show, taking that many shots from beyond the arc won’t be commonplace (“that was…not by design, for sure”) but he also said The Citadel would probably shoot more three-pointers than any team in the country. That is easy to believe. Baucom’s VMI team last year led the nation in three-point attempts, averaging almost 36 shots from 3-land per game. No other D1 squad averaged as many as 28 three-point attempts per contest. The pace of the game against Erskine was as advertised. In the first half, the Bulldogs had 50 possessions. In the second half, things got a little slower; The Citadel only had 44 possessions in that frame. It is unlikely that the Bulldogs will play a 94-possession game against a D1 opponent this season, at least in a regulation 40 minutes (VMI had a 94-possession game versus Western Carolina last season, but that one went 2OT). However, if The Citadel were to routinely average 85 possessions per game, it would almost certainly lead D1 in that category. Do I think the Bulldogs will average 85 possessions per game? No. I could see 80, though. 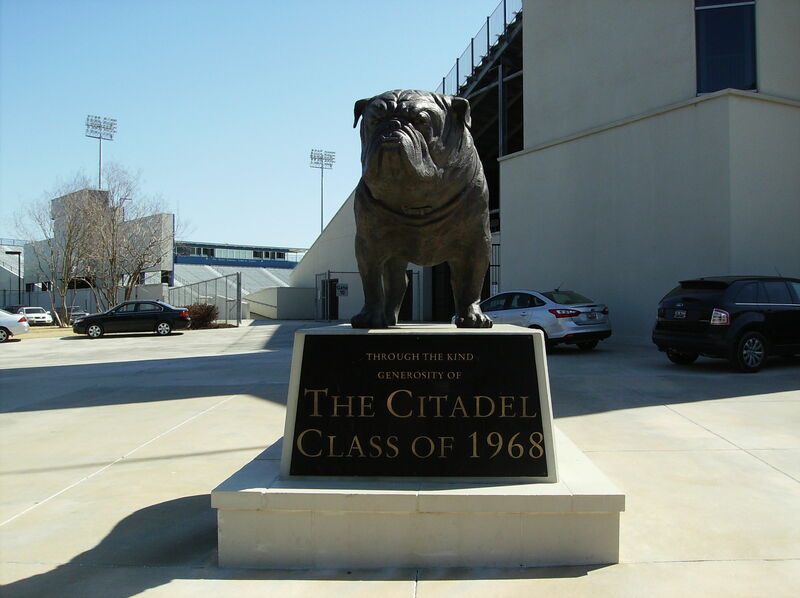 Butler may be the best team The Citadel will play in 2015-16, though there is just a dash of faint praise in that statement. After all, the Bulldogs’ non-conference schedule includes no teams from power 5 conferences (possibly the only D1 school for which that will be the case this season), not to mention 3 non-D1 squads. Regardless, the Indianapolis Bulldogs should be very good, with preseason rankings of #22 (USA Today Coaches’ Poll) and #24 (AP Poll). Butler was picked to finish third in the Big East preseason voting (behind Villanova and Georgetown). Butler has several excellent players, particularly Kellen Dunham and Roosevelt Jones, both preseason all-Big East selections. Last year, BU advanced to the round of 32 of the NCAA tournament, beating Texas before losing to Notre Dame. In 2015-16, Chris Holtmann’s squad was one of the best defensive teams in the nation (7th in adjusted defensive efficiency, per kenpom.com). Butler was very good at preventing offensive rebounds and defending the perimeter (opponents only shot 30.7% from beyond the arc). On offense, BU was a good offensive rebounding team that took care of the basketball, and did a decent job at getting to the foul line. According to kenpom.com, Butler has a 99% probability of defeating The Citadel on Saturday, with a projected score of 91-62 (and a possessions estimate of 74). The game will be televised on Fox Sports 2 (7:30 pm ET), with Alex Faust handling play-by-play and Dickey Simpkins supplying the analysis. If you’re driving back from Chattanooga and want to listen to the game on the radio, it will be on 1450 AM. Ted Byrne will call the game from Indianapolis for the Bulldogs (since Mike Legg will be at the football game). I don’t expect The Citadel to have a winning season in 2015-16, or to even be in the vicinity of a .500 record. This is a year for implementing Duggar Baucom’s system, and generating just a little bit of buzz. Normally I would complain about a couple of things, like the Charmin-soft schedule and some aspects of the roster turnover, but I also understand what is behind both of those issues, and am willing to be patient. I am glad to see a renewed emphasis on basketball at the military college. That includes three “Pack the Mac” events this season, the first of which is the home opener next week against Stetson. Things should be entertaining at McAlister Field House this winter, and you can see the action unfold even if you can’t make it to campus. All of the home games will be on ESPN3. I’m ready for a little roundball.